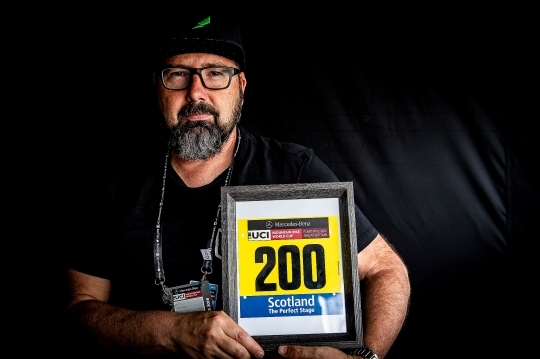 I’ve been very fortunate to be on the UCI Mountain Bike World Cup circuit full time since 1996 in various capacities, and this has resulted in reaching the 200 milestone this year in Fort William. The UCI surprised me with the number 200 plate pictured here below. I did a few events in 1994 and 1995 as a UCI Technical Delegate, before working for the UCI full time for 5 seasons in that capacity, and as MTB Coordinator, from 1996 to 2000. In 2001 I started 23 Degrees Sports Management and have had 4 different race teams since then. Here below are the events I’ve attended to reach 200, and of course, while I’m not planning on reaching number 300, I will continue to attend events in the future! Big thanks to Sven Martin svenmartinphoto@mac.com for the photo in this story.